The bottom line was that Maurizio Sarri wanted the Ivorian at Stamford Bridge and the ?40m (at least) to sign him could fund Milan?s desire to make Tiemoué Bakayoko?s loan permanent. 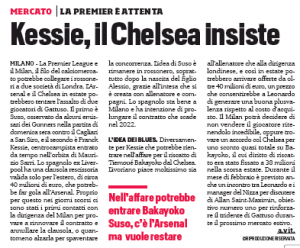 The Serie A side need ?35m to do that, money which they don?t currently have, and with both the player and the club wanting the relationship to go to the next level, Chelsea?s interest in Kessié is most welcome. While there is a clause of ?35m (or ?38m depending on the source) in the loan, it can easily be ignored, with a like for like swap be worked on instead. The post Club could use midfielder as part of swap deal for Chelsea player, makes some sense appeared first on Sport Witness.